← First Aid Changes 2013 – Are You Ready? 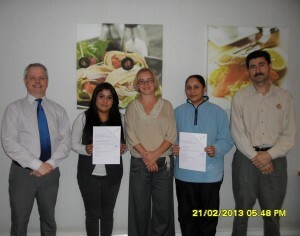 Whilst delivering the Level 3 HACCP in manufacturing at Mission Foods Coventry, Tom Scollen took the time to assist in the awards ceremony for the “Train the Trainer” course (CIEH Level 3 Award in Training Skills and Practice) that ran in Dec 2012. Successful Train the Trainer candidates were Wahab Elabor, Mathi Murali, Oscar Orozco and Gurpal Sahota. Tom says that the diverse nature of the group made for a fascinating training experience and he believes that they will go on to deliver great in house training programmes for Mission Foods. On a personal note, Oscar taught Tom and the class to make authentic quesadillas and this has now been added to the Scollen family repertoir for “cook nights” – thanks Oscar! The “Train the Trainer” qualification is ideal for candidates wishing to improve their training, presentation and communication skills. Candidates are guided through the process of design, delivery and assessment of a typical training programme. They get several opportunities to deliver their own session to the class and give and receive valuable feedback. Candidates completing this course gain knowledge and confidence in their own training ability and are able to deliver short training sessions to company staff. 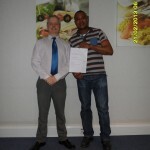 The Train the Trainer qualification is often accepted by awarding bodies when a person wishes to begin teaching subjects such as first aid or food safety.